For the past month, my life has been a storm of hassles culminating in a blood pressure spike from “low” to “high.” But an act of kindness from an unknown person put everything back in perspective. Ordinarily, my life is a quietly humming experience of grace. But that all changed on March 1, when the woman downstairs announced her intention to move. At first, it was just the routine of being a property manager: remind the tenant of their lease agreement and timeline regarding vacating, cleaning, utilities, etc. I was happy for her because her new location was closer to her friends and would enable her to have more independence from her daughter because she could easily walk wherever she wanted to go. The tenant in the studio apartment claimed “first right” to the one bedroom apartment that the woman would vacate in a month. The woman vacated on March 27; final cleaning was completed on March 29. I notified the man that he could move in as early as March 31, giving me a few days to check everything and do routine maintenance, if required. He refused. We talked, I sent him emails, and he just could not comprehend why he could not hold two apartments without paying double rent and double utilities. Essentially, why this move was exactly the same, regarding lease agreements, as moving to another state. But that wasn’t the only complication of what historically has been a simple process. There was also the matter of the highly recommended contractor who had said he would appear April 2 to examine the floor of that studio apartment, look in the crawl space, and begin construction immediately if it were called for to repair any structural damage. I knew this contractor was tightly scheduled on much larger jobs and would show up even on Saturday or Sunday mornings. He had shown up early on a Sunday morning to review last year’s request for new stoops and sidewalks. He then started on that Sunday, and completed all the concrete work in two days. He worked with his team and they tore down and replaced two stoops, built a new one for the side of the porch, ripped out forty feet of old concrete, and laid new sidewalks. I had waited a year for that project, had learned a lot about the contractor and his team, and I will not allow anyone to interfere with his schedule. When he arrived on Thursday, April 2 to inspect the premises and see how big the job would be and what kind of expertise he needed to hire for the repair job in the studio apartment, my quietly escalating stress was mildly mitigated. But I could not let a team of contracted workers in that apartment with the previous tenant’s WiFi stuff still there, and that is why I made the ultimatum: move it or I will. This tenant was paying $25/day to leave his WiFi equipment in the old apartment! The contractor’s visit that morning was followed by two hours of tennis, one more effort at cable company to get the Wi-Fi service moved, a doctor’s appointment where I learned my blood pressure had gone from low to high from a young female doctor whose bedside manner is “Aren’t I cute?” and an hour of hiking in the woods to chill out. And when I came home, I closed my blinds and sat down in front of my 23-inch computer monitor to “Netflix” Star Wars Next Generation. In the second episode of the 3rd series, a neighbor came up to tell me my parking lights were on. I said “Thank you!” and ran down the stairs to take the charging drive. It wasn’t my first time to leave lights on this past several weeks. 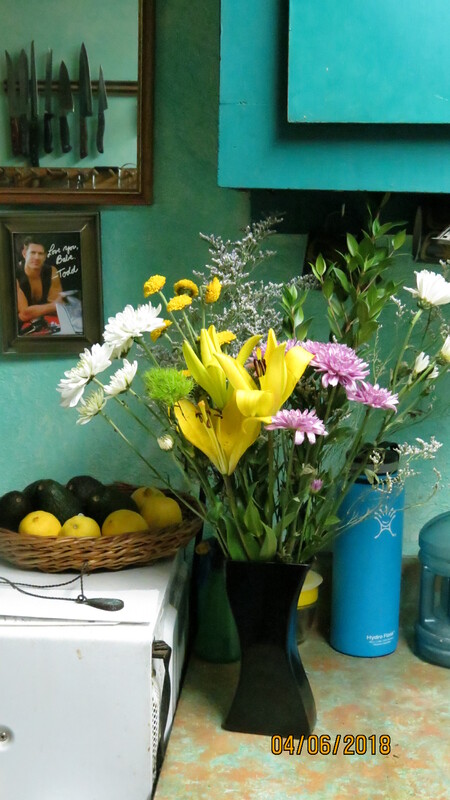 When I returned, I found a vase of flowers lying on its side by my front door. It had no card, and I had no idea who had put them there. I carried them into the kitchen, replaced the spilled water, and set them on my tiny counter instead of the dining table because it had lilies and some of those are poisonous to cats. Already my spirits were lifted. I felt calmer. I was so delighted by their beauty that I took photos of them, reminding me that I hadn’t taken photos (one of my loves) in a long time. The gift of flowers, this random act of kindness from an unknown person, completely changed my outlook molded by all the unpleasantness of the month — that people are stupid and rude and ugly and arrogant. This simple gesture reminded me that there are still some people who are kind, conscious, and generous! Thank you, whoever put those flowers on my porch. Thank you for your gift of beautiful flowers that lifted me up and helped me feel connected to the stream of goodness in life once again. This entry was posted in Personal Journey and tagged interesting times, kindness, one day at a time, random act of kindness, relationships. Bookmark the permalink. Thanks, Rod! It will be a while until I can get back to “writing” stuff. Great story, its true how random acts of kindness restore our belief that there are some really decent people out there! Thank you, Robyn Sweetman. And you are one of those exceptional people for taking the time to write your kind comment!